So now you know or you got an idea what Kakao Talk is through reading a previous post, ‘Kakao Talk and Ajumma (1)‘. I know it might be hard to understand what it is exactly before you actually use that application. If you know more about Kakao Talk, you should try to download Kakao Talk app and use it. It is a global and free service so anyone can use it through their smartphones. But I’m sure that using Kakao Talk in Korea have more various options (such as Kakao Shop, Kakao Pay etc.) that bring you to have a lot of fun. Anyway, try to use Kakao Talk first, I recommend. Today, I want to talk about Kakao Talk more deeply. Having communication through using Kakao Talk is pervasive in Korea because it is a sort of main tool for communication in our everyday practices. In short, we communicate with each other on Kakao Talk everyday. So we say “Let’s do Ka-Talk!”, “Send me Ka-Talk!” or “See you in Ka-Talk!” etc. Koreans love abbreviations and we call Ka-Talk instead of Kakao Talk. And when you see the sentence of “Let’s do Ka-Talk!”, you can tell ‘Ka-Talk’ is a kind of act. Ka-Talk in this case means ‘doing communication in Kakao Talk’s chat room’ or ‘we will talk about something in our Kakao Talk’s chat room’, etc. Thus the word Ka-Talk means not only one of applications, but also an actual action of having mobile communication in Kakao Talk’s chat room through using their smartphones. In my experience, I could be connected to my parents and friends all the time because of using Kakao Talk. Even though we were physically separated from each other, we could still be together technologically or mentally in the third space (e.g. Kakao Talk’s chat rooms). Compared with few years ago when there were no smartphones or Kakao Talk’s, (pre-smartphone era, I named) I had to buy international phone card to call my parents in Korea every time. This (sort of) traditional way of phone call communication restricted our time and space whenever we have a talk on the phone. However, Kakao Talk sets us free from the barriers of time and space whenever we have conversations on Kakao Talk’s chat rooms. This means that we can do mobile communication on Kakao Talk’s chat room regardless of time and space if there is wifi connection. And it is free. 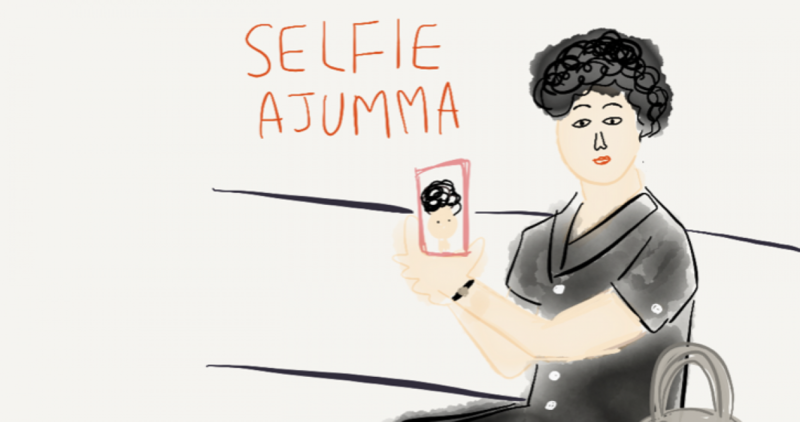 For next post, I will talk more about how ajummas use Kakao Talk with their family and friends. Posted on 13 Feb 2016 13 Feb 2016 by moon ajummaPosted in Smart Ajumma (English)Tagged ajumma, daum, 한국, 카톡, 카카오톡, Kakao Talk, Katalk, Korea, Korean women, Mobile communication.